The Silverton 39 Motor Yacht is dressed to impress. The 39's low profile and wide stance make for an excellent ride. Silverton Marine has a long heritage of building sturdy, seaworthy boats. The New Jersey-based company has produced some of the all-time bluewater classics, renowned for their practicality. If there was a downside to any of those older classics, it was that they were a tad utilitarian in design. They got the job done, but without a lot of fancy finery. However, today's Silverton is an entirely different boat — as the company's new 39 Motor Yacht exemplifies. The successor to the Silverton 372, the new 39 is more than just a refinement of that design. From the keel up, this boat takes the Silverton tradition to a new level. The 39's low profile and wide stance make for an excellent ride. They also open up the dimensions of the interior to a level of creature comforts that one might expect on the world's most luxurious yachts. Silverton's 39 Motor Yacht measures 43 feet, 7 inches in overall length and has a 14 foot beam. Contained in those numbers is a remarkable amount of utilitarian space — but there's nothing utilitarian about this boat's style. You'll probably want to spend a good deal of time inside the 39, so that's the best place to start our tour. Abundant cherry wood trim and cabinetry creates a warm, inviting atmosphere. Those cabinet and stateroom doors aren't veneer-covered: They're solid wood — an indication of the commitment Silverton has made to upgrade the level of quality throughout this boat. The cherry is complemented by Ultraleather upholstery in a pair of L-shaped seating areas on either side of the saloon. The settee to starboard converts to a double berth, and its aft leg makes an excellent spot for watching the television in the entertainment unit opposite it. A dining area is located forward and to port. It features an adjustable table — again, crafted of solid cherry wood. There's a coffee table that normally serves the starboard seating area — and it conceals a surprise. Lift out the two-piece top, flip it over and you'll find soft Ultraleather cushions on which to sit while using it as a dining table. The cherry motif continues into the galley, where it's accented with an ample Corian-topped workspace. There's enough room here — and on a separate surface, aft — to set out a complete buffet spread. Standard features in the galley include a three-burner flush-top electric range, a coffeemaker, a large under-counter oven and a separate microwave/convection oven — along with a refrigerator that has a separate freezer compartment. No need for options: It's all here. The galley is open to the saloon, one step down. The sole is real oak planking, with a high-gloss urethane finish. The 39's saloon area has a considerable amount of glass on three sides, which fills it with natural light. All of the opening windows throughout the boat are fitted with screens, as is the companionway to the cabin. On those days when it's just too nice to use the boat's optional three air-conditioning units, you can let in the fresh air without getting any unwelcome flying visitors. One of the most important things Silverton has learned from building boats over the years is that storage is just about the most important amenity you can get. No one wants to live out of a duffel bag for longer than an afternoon. 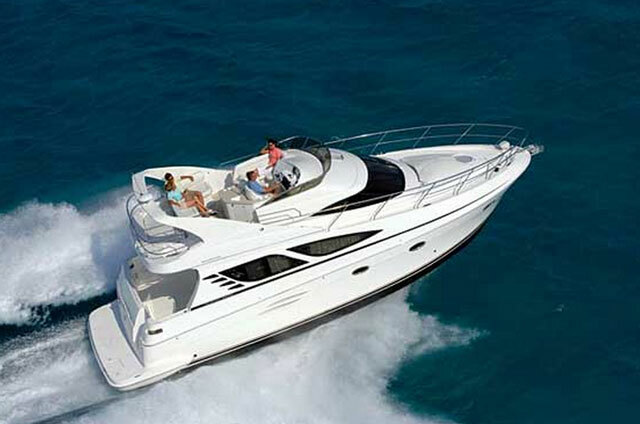 The 39 Motor Yacht makes optimum use of every available inch to provide ample space to stow your stuff. Case in point: There's a "cavern" under the forward stateroom berth, fitted with a shelf, that's big enough to swallow a complete extra set of bedding. Lighted cedar-lined hanging lockers flank the stateroom's double berth, and the space gets a generous wash of natural light from the hatch above. The master stateroom, abaft the saloon and a couple of steps down, also takes full advantage of every storage opportunity. You won't find the same cavern under the master's queen-size berth as in the forward stateroom, but there are two nearly-as-large lockers on either side of the pair of drawers in its base. A full-length hanging locker stretches from floor to ceiling, and there is a pair of half-length ones, as well. You'll even find a place for linens and cleaning supplies in the head. There are two full heads on board the 39 Motor Yacht. The forward head, serving the guest stateroom, is as spacious as some I've seen in master suites. It features a separate shower stall, power ventilation and air conditioning. The master suite features a split head arrangement, with the shower in a separate compartment from the one that holds the toilet and sink. Solid cherry raised-panel doors add a touch of elegance. Of course, you'll want to spend some time on deck, too — and it's also remarkably spacious. 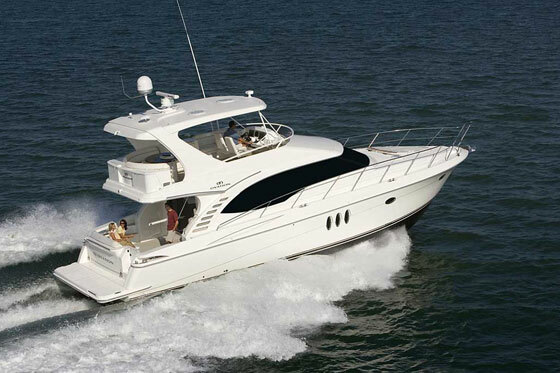 The flybridge has seating for three at the centerline helm position. Each place has armrests, and the driver's seat adjusts fore and aft. A flip-up bolster allows the captain to stand up at the wheel for maximum visibility — and this includes sightlines to the stern corners for docking. Bench seating for seven around the helm forms a U-shape along the aft half of the flybridge, with a break for the stairway down to the aft deck. 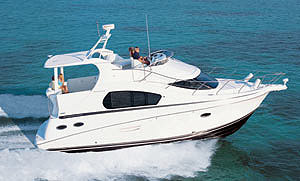 The aft level has a built-in bench seat that takes up no floor space, because it's bumped out over the stern. There's room for a table and chairs for alfresco dining, and it's served by an entertainment center to starboard. Our test boat was fitted with an optional full canvas enclosure. 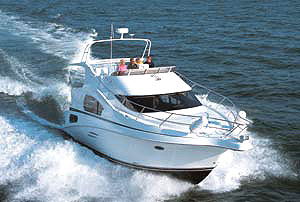 It surrounds the flybridge and the aft deck, yet it doesn't separate the two spaces. The standard hardtop above the aft deck breaks short of the flybridge, so the crowd below can converse with the crowd above. Incidentally, the side curtains on the aft deck include screen panels, so you can enjoy breezes without a flying bug horning in on the action. The 39 offers two boarding options, depending on tidal conditions or the height of your dock. There's high access from starboard at the aft deck level; as well as low access from the swim platform. Eight power options for the 39 Motor Yacht range from twin 370 hp gasoline big blocks to 450-hp diesels. 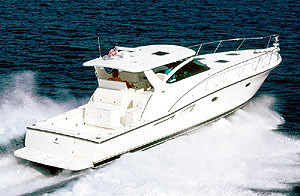 Our test boat was fitted with a pair of Caterpillar 3126's rated at 385 hp. Even with one of the lower horsepower selections, our test boat moved along nicely. It came on plane in about seven seconds with a slight bowrise and remained at that attitude while running. The 39 has a somewhat lower center of gravity than its predecessors. This, coupled with large rudders, makes it very responsive to the helm. The day we tested the boat, we had a stiff 20 knot wind blowing — but it proved meager hindrance to the 39's slow speed maneuvering. The 39 shows its refinement by being the strong, silent type. 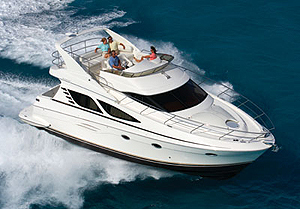 While at the helm, you'll hear the engines running — but just barely enough to notice that you're cruising in style. What options are available for TV/video equipment? 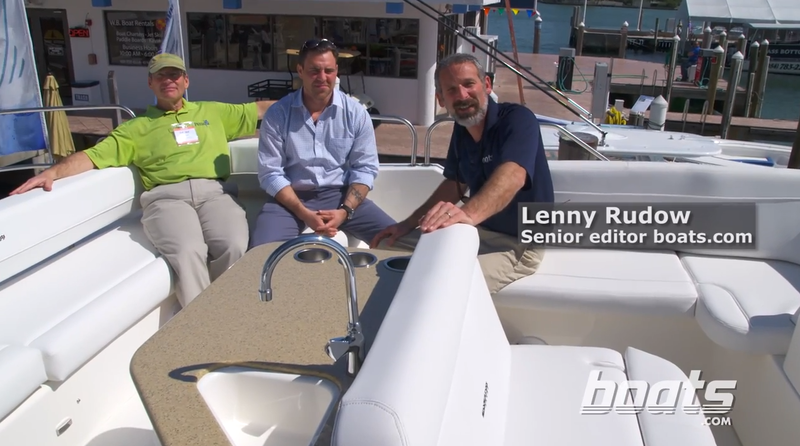 What are the flybridge and aft deck enclosure options? Hardtop, AM/FM/CD stereo (flybridge), AM/FM stereo with CD changer (saloon), 3-burner flush-top range, microwave oven, coffeemaker, Corian countertops, refrigerator/freezer. 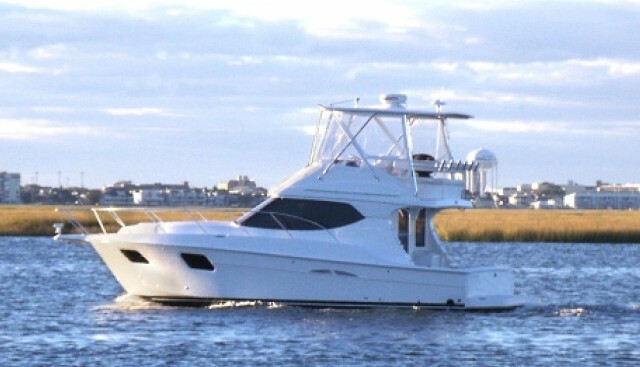 Full flybridge and aft deck enclosure, Sprint windlass, Glendinning Cablemaster, Oil-X-Change-R, 8 kw auxiliary generator, three-zone air conditioning/heating, oven, Raymarine electronics package, exterior carpeting. Hull has a fiberglass bottom (4 x 24 oz. ), with Coremat used above the waterline.